Showcase your reviews in Facebook page to increase traffic and builds credibility for your Brand. Note: This feature is available on Premium & Enterprise plans. 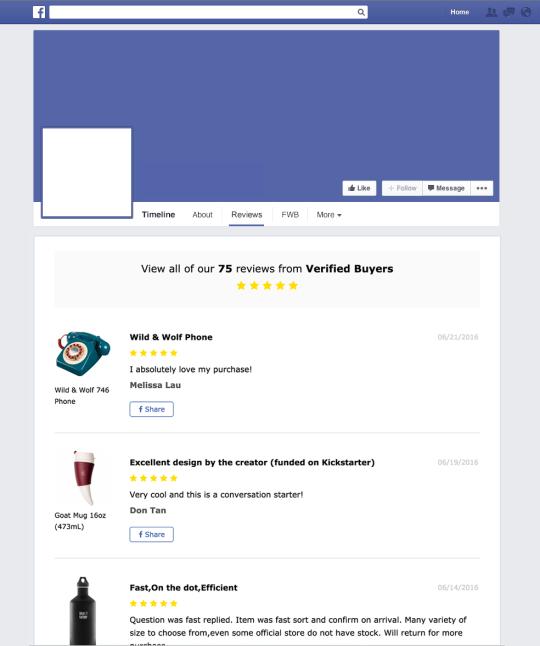 Facebook Reviews Tab will showcase all of your product reviews in one neat tab. Each review includes a Share button, so your customers can help you spread the word of your positive products reviews to their friends. Why use Facebook Reviews Tab? 68% of your customers would check your Social Media pages before buying, and this may be even more true if it was a website they hadn’t shopped with or heard of before. Showcasing reviews in your Facebook page is a fantastic way to increase brand’s credibility, that’s a potential 68% of your customers who could be pushed to press the BUY button with just a quick glance at your Facebook page. How do I add the Facebook Reviews Tab? You can read this guide to start adding the Reviews Tab to your Facebook page. If you have any questions, do get in touch with us at hello@shopry.com. I actually upgraded my account to use this feature, unfortunately FB does not allow custom tabs for business pages with less than 2,000 likes...not a happy camper with FB and not being able to use this cool feature. Does this move the reviews from your website to your facebook page?